, are you interested in helping other parents? 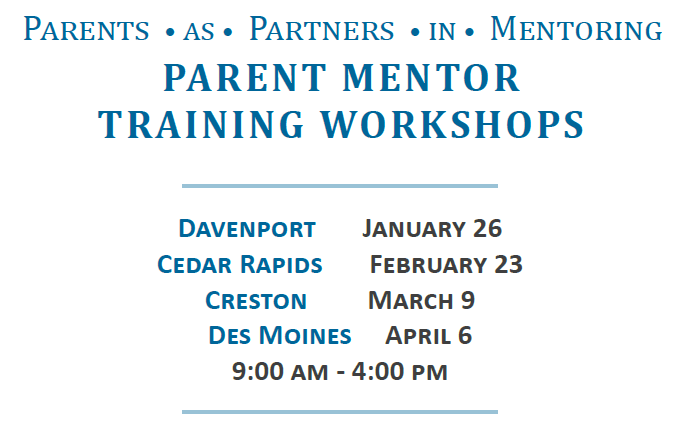 Free parent mentor training workshops will be held in across the state through Winter and Spring 2019! The goal of this workshop is to train parent volunteers to provide support and expertise for families by giving them the skills and supports they need to help their child with a disability to reach their full potential. Become a trained parent mentor and be a source of strength, hope, direction, and help for other parents! Questions? Contact Paula Connolly at paula@askresource.org or 515-243-1713 ext. 206. Find training flyer and details at www.askresource.org/calendar or c lick the links below to sign up for this no-cost training! Have you avoided leadership opportunities because you aren’t sure how to preside over a meeting? Listen to this presentation to become familiar with basic principles of Robert’s Rules of Order, how to preside over a meeting from beginning to end, and parliamentary procedure “lingo” and phrases to use. Click for handouts . A family from Early Access, teamed with one of their child’s providers, will discuss their learned experience in this informative webinar. Meet Melissa and Adam, and their son, Jaxson, who is Deaf with additional disabilities, often referred to as Deaf+. Jaxson's provider, Michelle Pandian, is an audiologist with Heartland AEA. Melissa and Michelle will share their stories working together over the recent months. This funding opportunity is an effort to connect Iowa families of children who are D/HH, ages 0-3. These funds will provide financial support to any community organization, group or individual with an idea of how to introduce and bring together young D/HH children and their families. The goal for these outreach activities is to create opportunities for families with young D/HH children to connect, socialize, share resources and build relationships. You can submit your application by email karen@askresource.org using subject line: FAMILY SUPPORT APPLICATION, fax to 515-243-1902, or mail to ASK Resource Center attn: Karen Thompson, 5665 Greendale Road, Johnston, IA 50131. After having just made it through the increasingly hectic holiday season, it’s a great time to review some steps that led to successful family events and/or outings. You made your list, checked it.... a few times. For some sensory seeking children this is a great time of year, but for many it can be overwhelming with all the sounds, sights and smells. But as you prepared, you kept in mind that those sensory systems need a good holiday diet to keep everyone’s well-being in check. Whether your child loves or loathes the sensory input and routine changes, these tips are great to keep in mind as you plan and prepare for future events. Continue reading at www.friendshipcircle.org.. 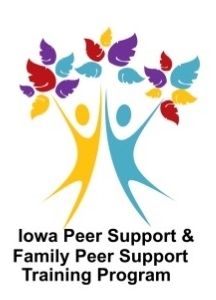 The Iowa Peer Support & Family Peer Support Specialist program offers a robust catalog of education opportunities for Family Peer Support Specialist (FPSS), Peer Support Specialist (PSS), and supervisors in Iowa. Take advantage of these trainings to increase your marketability, improve your skills, and have a pulse on the mental health landscape in Iowa. The immediately upcoming trainings are listed below, but you can browse all of their workshops and webinars at www.iowapeersupporttraining.org/trainings. The theme for this year’s series is "Integrating Peer Staff in the Agency and Mental Health Treatment Community". Each online session will include 15-20 minutes of content and 10-15 minutes of discussion. A series of 90-minute live interactive webinars offered in Spring and Fall 2019.The trainings can be viewed in any order, and a continuing education certificate of completion will be provided after each 90-minute segment.